Home base. Down home. Home free. Take home. Home is where the heart is. In Boston, “home” is often just a word as so many find themselves displaced from housing due to increased costs and slow growth of earnings. The housing crisis in Boston is real. It’s devastating, life altering, and dehumanizing. Home Is Where grows out of sadness and feelings of powerlessness in resolving this appalling issue. However, embedded in the work is also an element of hope. Utilizing reclaimed wood along with delicate, translucent papers and encaustic* medium, I connect strength of structure with the fragility of insecurity. The small landscapes have paper layers of segmented divisions signifying needs, space, and place, while the foreground bears the shape and dream of home. 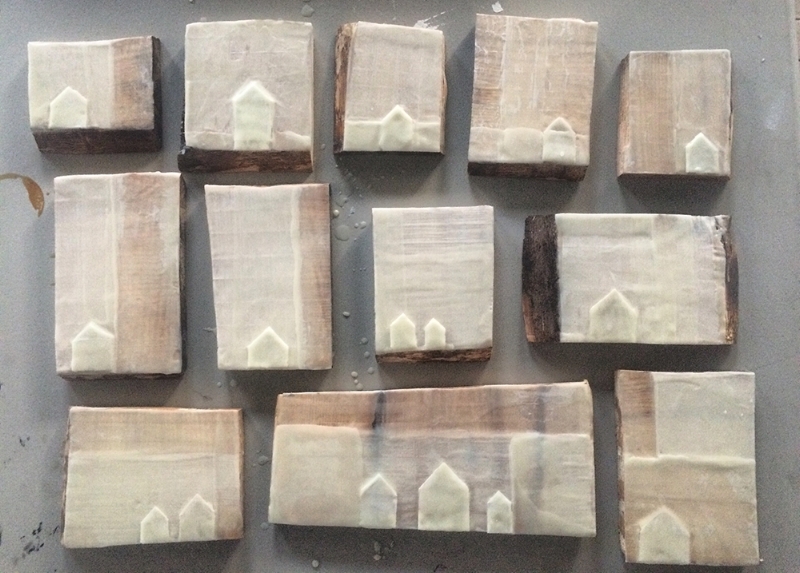 By creating and exhibiting this work I hope to bring attention to the growing housing crisis in Boston and along with City Life/Vida Urbana, be able to do some good. 50% of all sales of Home Is Where will be donated to City Life/Vida Urbana to aid in their mission to fight for racial, social and economic justice and gender equality. Their roots are in promoting tenant rights and preventing housing displacement. In organizing poor and working class people of diverse race and nationalities, City Life/Vida Urbana promotes and develops individual empowerment to effect systemic change and transform society. This work will help our neighbors, friends, and family find home. * Encaustic medium is a combination of raw beeswax and damar resin. It is applied in molten form in layers, and fused at high heat. Encaustic is a very durable artists’ medium because beeswax is impervious to moisture; it will not deteriorate, it will not yellow, and it will not darken. Encaustic artwork does not have to be varnished nor protected by glass.